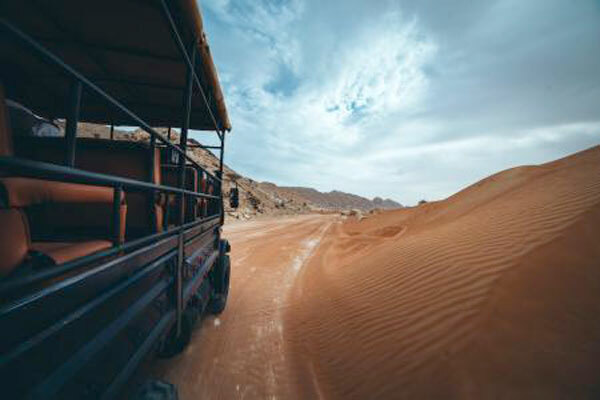 Mleiha, Sharjah’s leading archaeological and eco-tourism project, has announced the launch of two unique packages to enhance visitor experience and let them explore the destination in different ways. Mleiha is known for offering a lifetime experience to the visitors that not only gives them an adrenaline rush but also invigorates their senses with breathtaking activities in the picturesque landscape. Located in the historic dunes of Mleiha, the activity site is merely 40 minutes away from the emirates’ city lights. It is a nominated Unesco World Heritage Site and is marked by archaeological sites dating back to ancient human history, offering trekking and dune drives across the sand dunes, gravel plains and limestone mountain landscapes. The new packages have been launched with an aim to offer something unconventional to repeat visitors, in line with Mleiha Archaeological Centre’s vision to improve the overall visitor experience. As part of these efforts, the specially designed UNIMOGs have been redefined as ArchaeoMOGs. This expedition truck has been specially designed for explorers, discoverers, and adventurers. One could spend time traversing the terrain, visiting the museum, walking through the Mleiha stables and journeying into the Valley of the Caves while crossing the old quarries to reach the final stop for refreshments. For cycling enthusiasts, who wish to test their endurance levels, the new-designed packages take them on a heart-pumping tour while discovering the spectacular nature and stunning wildlife around. Explore the massive area with thrills and spills on specially designed Fatboy bikes equipped with good gears and extra wide tyres to make it possible to cycle uphill with family and friends. Different packages like Breakfast Ride, Sunset Lounge Ride, Tomb Riders, Sport landscape Tours are available to choose. Visitors can also opt for special tailor-made tours as per their requirement. Highlighting Mleiha’s image to uncover something new for people revisiting the site, Mahmoud Al Suwaidi, Manager of Mleiha archaeological and eco-tourism project, said: “The new packages and continuous additions along the line allow visitors to gain a deeper insight into the region's rich historical legacy in an enjoyable and interactive manner. Designed to cater to the needs of tourists and provide them with information about Mleiha's history, the Centre highlights archaeological finds and features informational and educational displays with historical facts." Al Suwaidi further added: “This multi-purpose edutainment destination takes you away from the hustle and bustle of the city and allows you to enjoy the desert in different ways while learning about the archaeological treasures left behind by successive civilizations throughout history."